Silver Labs from a Silver Labrador Breeder You Can Trust! Pinyan Labs is a small family breeding affair. 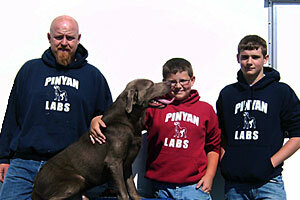 My sons, Junior (15), Jacob (13), and myself Ron, operate Pinyan Labs. We breed silver labs, charcoal labs, and silver factored chocolates. I have been a Labrador breeder for 15 years and I have been hunting side by side with them for 20+ years. When it comes to breeding silver lab puppies, we have the experience and know how. This isn't a "get rich quick" scheme for us. Silver labs have been part of our lives for the last several years now. It has become our specialty and our passion. 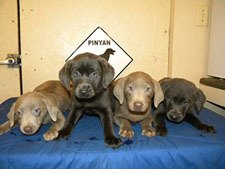 Our silver labs and charcoal labs are AKC purebreds and are absolutely gorgeous! They have the traditional look and characteristics of a lab, with an attention grabbing color of silver or charcoal. Our silver labs and charcoal labs have a dual purpose for us. They are first and foremost loved family members and pets. Secondly they are hunters, with strong hunting backgrounds. We are located in Ankeny, Iowa, just minutes north of Des Moines. We are one of the few Labrador breeders to have silver labs in Iowa. Our goal at Pinyan Labs is to offer lab puppies of the highest of quality, second to none. Whether you are looking for silver labs, charcoal labs, or a silver factored chocolates, you can rest assured that our lab puppies are of top quality. We encourage you to find out more on how to find a perfect silver lab breeder. We would love to make one of our lab puppies one of yours. If you would like to find out about our current silver lab puppies available, be sure to visit our lab puppies blog where we have photos and descriptions of our current puppies. If you are serious about adding a silver lab to your family, or just curious, we are an honest Labrador breeder and will answer any and all questions you may have. Thank you for visiting Pinyan Labs and viewing our silver labs and charcoal labs.